The Underground Railroad Collection is a sampling of objects and paintings from the New-York Historical Society Museum that tells the story of resistance to slavery, the movement of fugitives, and the experiences and achievements of the enslaved and the free African American community of the North. 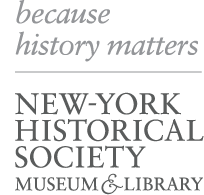 Many of the New-York Historical Society's founders and nineteenth-century members had deep roots in New York; a significant number of them descended from families who immigrated in the seventeenth century. In 1863 Lucy Bakewell Audubon, the widow of John James Audubon, sold to the New-York Historical Society her husband’s preparatory watercolors for his seminal work The Birds of America (published serially in London between 1827 and 1838). The New-York Historical Society holds one of the oldest and most comprehensive collections of landscape painting by artists of the Hudson River School, the first school of truly American art to garner worldwide recognition and fame. The avant-garde sculptor Elie Nadelman (1882–1946) is widely recognized for his elegant and spare modernist sculpture. Less well-known is Nadelman's role as a pioneer in collecting folk art in this country and his impressive material legacy acquired by the New-York Historical Society in 1937. The New-York Historical Society's entire collection of 132 Tiffany lamps and three windows came as the gift of a single collector, Dr. Egon Neustadt, in 1984. A limited selection of this collection is on view in the Luce Center. The games that entertained Americans from the 1840s to the 1920s offer a fascinating window on the values, beliefs and aspirations of a nation undergoing tremendous change. Bella C. Landauer (1874–1960) was an insatiable collector of objects made for business and advertising purposes. In 1926, she gave a large portion of her collection to the New-York Historical Society. Robert R. Livingston (1746-1813) is remembered for an extraordinary political career that spanned the Revolutionary War years through to formation of the American Republic. Intellectually gifted, Livingston also was known for having a restless and inquisitive mind. He found engagement within the domestic and natural environs at Clermont, his family estate in the Hudson Valley, where his private interests included French furniture and silver, agriculture, and merino sheep raising, to name but a few. Livingston's many interests are reflected today in the rich assembly of his possessions now in the collections of the New-York Historical Society. Asher B. Durand (1796–1886), a central artist of the Hudson River School, spent nearly twenty-four years as a successful commercial engraver. His talent as an engraver was based on his drawing skills, explaining his insistence on the importance of outline, the precise renderings in his sketchbooks and drawings, and his devotion to sketching with graphite outdoors. The artist’s empiricism and dedication to Nature is evident in the ten sketchbooks (two fragmentary from sketchbooks now disassembled), 310 drawings, and 79 paintings held by the Historical Society, where they are joined by an extensive trove of objects, documents, and prints that make it the largest single Durand collection extant.